Formula and Application: I figured I'd start out mentioning how the polishes applied because they were pretty much the same in that they were all perfect. Lake Huron was the only polish that needed 3 coats, but that's just because it had more of a jelly finish than the rest. Honestly, I don't have anything negative to say about the formula. I would recommend that you use a good basecoat with these because some of them are the type of pigmented blues or greens that will stain. I had no issues with any staining, but I always make sure to use 1-2 coats of basecoat to make sure it doesn't happen. Nobody likes having Smurf hands. Inspired by the deep blue to purple with a red tint that Lake Erie can give off, especially after sunset. I've been lucky enough to see Lake Erie at sunset, and it really is a beautiful sight (most of the time). It's a deep blue color with navy microflakes and a scattered holographic finish. There's also red to gold shimmer, but I was unable to capture it well with my photos. Photos show just 2 easy coats. Inspired by the deep blue that throws back a green hue from the sunlight. 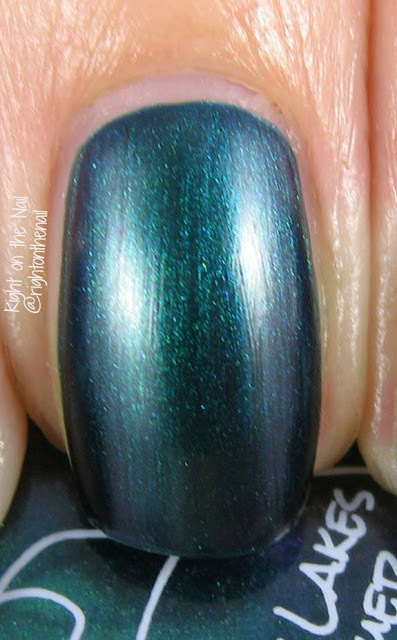 Lake Huron was the sheerest of the polishes, but that's because it has more of a jelly finish. I could have easily gotten away with 2 coats, but a third was needed for the bright light from pictures. Also, if you have short nails you won't have a problem with a visible nail line. Inspired by the light green to aqua to deep blues of one of the most beautiful lakes in the world. Inspired by the sapphire blue and deep sparkle that the big lakes can give off when blazed with sunlight. Pictures show 2 easy coats (you may need 3 if you use really thin coats). If you do happen to use 3, I would wait an extra minute between coats to ensure there's no dragging. Inspired by the northern lights running across the lake at night. Google Lake Superior Northern Lights. I may have found some new wallpaper for my phone or computer. This was just 2 coats, but make sure to use a good basecoat. I didn't have any staining, but there's always a chance. Make sure to check out what Mariah is up to on her Etsy, Facebook, and Instagram pages as well.